The 2009 inductees are: Willie Maley, Dave Meiklejohn, Jimmy Delaney, Alan Gilzean, Bertie Auld, Maurice Johnston, Paul Lambert and Steve Archibald. 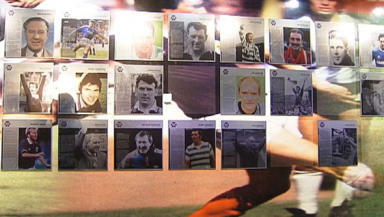 The Scottish Football Hall of Fame will receive eight new members today when Maurice Johnstone unveils the latest inductees. As Celtic’s first ever manager, Willie Maley has a place at the heart of Scottish football. He was appointed manager aged 29 and went on to win 16 league titles, 14 Scottish Cups, 14 Glasgow Cups and 19 Glasgow Charity Cups. After signing for Rangers from Maryhill FC, Dave Meiklejohn went on to make 563 appearances for the Ibrox club. He won 12 league titles and five Scottish Cups with Rangers and was capped for Scotland 15 times. After retiring from the game Meiklejohn went on to manage Partick Thistle for 12 years. Jimmy Delaney enjoyed a lengthy 24-year career as a footballer, winning the FA Cup and the Scottish Cup along the way. He started his career with Celtic where he spent 13 years notching up 305 appearances before moving to Manchester United where he remained until 1950. Spells followed at Aberdeen and Falkirk before a stint in the Irish Football League, then a move to Elgin City in the Highland League. Alan Gilzean signed for Dundee in 1956 and went on to score over 100 goals for a side which won the league title and reached the European Cup semi-final and the Scottish Cup final. He joined Spurs in 1964 and stayed there for ten years, helping them to win the FA Cup, the Uefa Cup and two League Cups. He bagged 12 goals for Scotland in 22 games. One of the most famous of Celtic’s sons, Bertie Auld enjoyed two spells with the Glasgow club and was part of the 1967 European Cup winning side. Spells with Birmingham and Hibs preceded a management career which spanned Partick Thistle, Hibs, Hamilton and Dumbarton. He won three Scotland caps. Maurice Johnstone started his career at with two and a half successful seasons at Partick Thistle. After joining Watford, where he enjoyed an FA Cup final, he signed for Celtic where his goals helped the club to a league title and a Scottish Cup. Two years later he gained notoriety for signing for Rangers after promising a return to Celtic. Moves to Everton, Hearts and Falkirk preceded his move to the US where he is now director of football at Toronto FC. Midfielder **Paul Lambert **spent much of his early career with St Mirren before embarking on a series of moves which would see him win glory on the highest stages of world football. A move to Borussia Dortmund followed three years at Motherwell. He excelled in Germany, winning the Champions League as he continued to accumulate his 40 Scotland caps. He moved to Celtic where he won four SPL titles, two Scottish Cups and two League Cups as well as skippering the side to the Uefa Cup final in 2003. Steve Archibald enjoyed a glittering career as a player. in 1977 he joined Alex Ferguson’s Aberdeen from Clydebank, he helping to win the league title in 1980 before joining Spurs. There he won the Uefa Cup and two FA Cup titles, before joining Barcelona. He again won the league title, then returned to Scotland for spells with Hibs and then St Mirren.